At my Grandpa’s house, there was a gargantuan fig tree. This tree provided figs for the whole neighborhood and also supported a rustic swing-just a rope with a plank seat threaded on it through two holes. Within my memory, though, the tree had gotten so big that a lot of its crop of figs fell to the ground before they could be saved (as jam and preserves) for later. So, for a short period every year, the yellow jackets would swarm over the ground and our bare feet were at serious risk for stings. I found the fruits to be a weird texture for which the taste did nothing to compensate. I could be persuaded to have a bit of Grandma’s fig jam because it was reminiscent of Fig Newtons, but stewed figs, fresh figs, anything fig-y, I gave a pass. 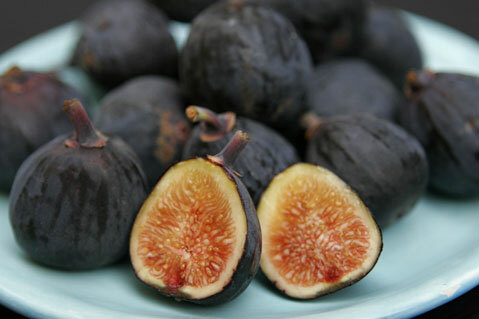 For many people, though, the season of figs is heavenly. And that season is now. The edible fig (Ficus carica) has been grown for thousands of years, and there are a number of selections to choose from. Many grow well in our mild climate, which mimics their Mediterranean origin. Most varieties actually have two crops, one in early summer and the heaviest one just now. The former grows on last year’s wood and the latter on new growth that was made during the spring and summer. When pruning, in winter, just like most fruit trees, be sure to leave some of the current wood to bear that first harvest and encourage new growth for the fall crop. Here are a few of the varieties beloved by local growers. ‘Mission’ has purple, nearly black, skin with sweet pink flesh and grows well throughout the state. ‘Brown Turkey’ is a small tree; perfect for garden culture, with brownish, purple fruit. 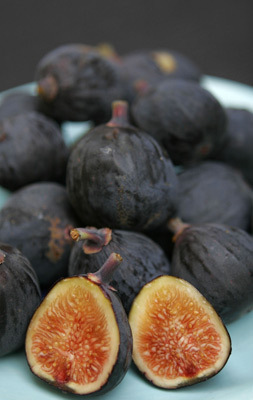 Some figs are greenish yellow when ripe, like ‘Genoa’ (also known as ‘White Genoa’). Its flesh may be pale or strawberry pink. Another pale fruited variety is ‘Kadota,’ and while it can be grown along the coast, it likes the heat of interior valleys. ‘Osborn Prolific’ is very successful in the Pacific Northwest and coastal Southern California growers are also finding it a good choice. Last chance to divide irises, agapanthus, daylilies, and the like. Replant immediately. For show-quality camellias, pull off all but the terminal bud on each branchlet. Switch from balanced fertilizer on cymbidiums to one with higher phosphorus (the middle number on the label), such as 15-30-15. Want your hydrangeas to be blue? Add aluminum sulfate to acidify the soil; one teaspoon per foot of plant height in the ground or one-fourth teaspoon per potted plant, mixed in water and applied as a soil drench.